This entry was posted on April 11, 2010 at 13:50 and is filed under Climate science, English. You can follow any responses to this entry through the RSS 2.0 feed. You can leave a response, or trackback from your own site. Without regression analysis, absent from your post, everything you just said is armwaving. That analysis has to involve cointegration, as VS has shown here. Where is yours? Bart: further to my last, your claim there has been “No increase in solar output (or decrease in cosmic rays) over the past 50 years” is not correct. The NOAA/NREL data across the USA from 1960 to 2006 shows very significant variability in realised solar output at each and every location for which they have data. sorry Tim, this is not arm waving. we need absolutely zero statistics, to figure out that the sun will not explain the last decades of warming. it is called “looking at the graphs”. Do-it-yourself climate assessment. Accurate calculation of average earth temperature for at least 114 years and counting with no need whatsoever to include the effects of change to the level of atmospheric carbon dioxide or any other greenhouse gas. See how at sc25.com. Do you always get addicted to new words that you don’t particularly understand? This link ” solar output (including cosmic rays) remained steady (or even decreased a bit) since the 1950’s” was not working when I checked. You probably know about this paper by Feulner and Rahmstorf (2010)? Their results are not surprising given that the impact of solar variability on global SATs is estimated to be at most 0.18 C over a solar cycle (e.g., Camp and Tung). Also read pg. 16 of the Copenhagen Diagnosis and references cited therein. Tamino has also done some really good work in this area (i.e., role of solar forcing). Try using them to explain the last 5 billion years. Osborn, do you really expect people to fall for your straw man arguments and red herrings? You have to do better than that if you want to be taken seriously. Please watch Dr. Alley’s talk that he gave at the AGU last year. Also, consult the plethora of literature and research out there explains the now well understood role of GHGs, Milankovitch cycles and other drivers in modulating climate. PS: And isn’t the best estimate 4.6 billion years? Actually, our dear honest questioner will have a problem to explain most of the warm periods during the earth’s existence by solely invoking the sun. Remember, in the early beginning, the sun had an output that was much lower than today (estimates range between 20-30% lower output). even with the recently discussed albedo differences due to different land mass distributions, a 20-30% lower solar output would result in an earth which was MUCH colder than it was in practice. MapleLeaf, you beat me to it regarding the Feulner and Rahmstorf (2010) paper. I also think it is quite absurd to believe that the sun is the primary driver of climate change in the past several decades. At least pick a horse in the race that has four legs! 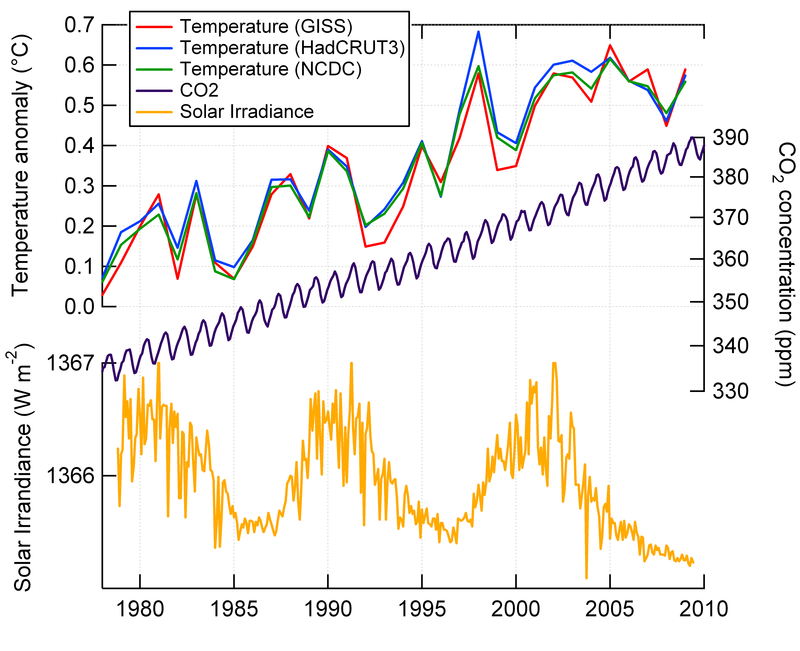 in principle you don’t need 1:1 correlation between the sun and temperature to have world temperature be solely dependendant on what the sun does, even if the sun has had no changes whatsoever for 20 years. Just introduce suitable lags and the like, ie temperature could be up now because the sun caused ocean currents and sea ice / cloud pattern changes 20 years ago and they took their time to work through. You of course also need to explain why CO2 has zero net effect when laboratory measured radiation properties tell us a doubling should give an extra 1C. For that, pure feedbacks won’t do. They never get you to zero. But, if it’s not a feedback, but simply another impact of the CO2 on climate, then you could go to zero. I think of the picture as CO2 getting the chemical and biological systems of Earth to do a bit of geoengineering. If say algae or bacteria can change ocean or cloud albedo or relative moisture in the atmosphere a bit, then they could fully negate the 1C increase from doubled CO2, or in principle more than negate it. And they could do this primarily based on what CO2 does to plant life say, rather than through what temperature does to plant life; so that ice sheets, solar forcing and greenhouse gas forcings from different greenhouse gase all could have very different net effects on climate for the same radiative primary forcing (ie and eg the 1C for doubled CO2). Now, I am happy to buy the line that climate sensitivity is close to 3C, hmm that the probability distribution is such that 2C is not very likely, but then again my opinion on what do about climate change crucially hangs on my choice of a high discount rate and my belief that a little warming and CO2 on its own (climate effects aside) are a net positive, and that I think climate impacts are quite reversible through CO2 drawdown and/or geoengineering. I can see why Tom Fuller won’t just swallow the line that 3C is basic physics. 1C is basic physics I think. 2C (the water vapour feedback) is swallowable as nearly being basic physics. That cloud feedbacks add another 1C is rather less so. 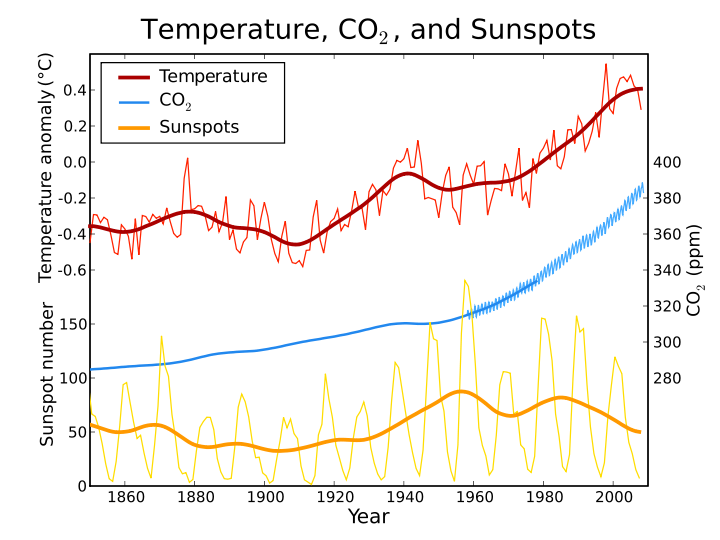 In principle you don’t need 1:1 correlation between the sun and temperature to have world temperature be solely dependendant on what the sun does, even if the sun has had no changes whatsoever for 20 years. Just introduce suitable lags and the like, ie temperature could be up now because the sun caused ocean currents and sea ice / cloud pattern changes 20 years ago and they took their time to work through. That has been tried by various studies, e.g. taking estimated forcings, and curvefitting them with suitable timelags to the observed temp record. The result is that solar remains a very minor player. And that’s no surprise: A lagged response would mean that the response only slowly fades away (e.g. over decades). Bit it does not mean that the response is small during the time of maximum forcing, and then suddenly jumps up (temp increase afyter the mid seventies) decades after the forcing stopped (solar leveled off in the fifties). That can not be explained by a lagged response. You’re right that a climate sensitivity of 3 degrees is not derived from first principles, but from various observed climate responses (volcanoes, LGM, etc) a value not too far removed from 3 is deemed most likely. it all depends on the mechanisms involved. In the case of the seasons, solar forcing falls up to December, but the minimum temperature is reached in February when solar forcing is already increasing. If you had a graph of solar forcing and Dutch temperatures from November to February of 2009 to 2010, you’d think that there was strong correlation for the November to December period, and you’d be perplexed by December to February. But, I wasn’t just talking about a simple lag like that. In principle, it could be more complex. Look at a pile of wood left in the winter. Its core temperature might rise over the summer, initiating biological degradation. The temperature in the core continues to rise, and then sometime in December, in spite of the fall-off in external temperature, the core temperature has risen so much that actual combustion is initiated and the pile burns down. While the correlation between outside temperature and core temperature may be terrible, it is indeed the thaw-up over summer that is responsible for the fact the piles burns down the following winter. The lack of a correlation in the data does not exclude the possibility of causation, whether the original cause is CO2 or solar. I think this only works well the other way around, if there is really close correlation this may be good prima facie evidence of a link. Say I switch a light switch a hundred times and every time the light goes on, chances are that that light switch really does control the light and it isn’t pure co-incidence and say the light comes on by co-incidence with the real cause being the emergency generator kicking in. Let’s try to explain this differently. Suppose a hypothetical, via a chemical effect on clouds CO2 always precisely cancels out the radiation forcing, and a change in CO2 concentration therefore never causes any temperature changes. Suppose for simplicity, there is only one forcing that does change with time and the the climate has no random feedback features, and that therefore solar forcing is responsible for all temperature changes. I think that any forcing input graph could be transformed into any temperature output graph given the right function to translate one into the other. We can have clear causality with a function T=f(solar forcing, t) no matter the shape of the graphs for T and solar forcing. The max temp can (and is indeed expected to) be reached later, but *the rate of change* isn’t suddenly increasing long after the change is insolation has stabilized. Your wood analogy basically describes a runaway positive feedback process. Very unlikely in climate, at least in the regime we’re in right now. sometimes it seems all too easy to be talking past each other, especially when using analogies. I know how a simple thermal lag works and I also knew your earlier postings that you referenced in your first reply. And my point most certainly is not that solar forcing is likely behind the recent temperature increase. Even the apparent correlations you point to, namely little ice age = sunspot minimum, early 20th century warming = increased sunspot numbers, may be spurious, or at the very least partially co-incidental with say of the 0.4C warming in the beginning of the 20th century only 0.05C being due to the sun, and 0.1C being due to greenhouse gases and 0.25 being related to ocean current changes with a cyclicality of 30 years. My key point is rather that there is quite a bit of room in things like albedo of clouds or the ocean, or relative moisture, that we don’t understand well and can’t constrain effectively enough through measurement either, that there is the possibility of mechanisms affecting them that yield several degrees C, and that these mechanisms need not be feedbacks or mediated via simple lags. They could follow other rules, say biological cycles of algal species displacing each other, or physical cycles with cloudiness having a 30 year cycle of increasing or decreasing albedo. They could in effect be random, with the random variant additive. They could be directly related to CO2 concentration, eg bacteria making surf on oceans whiter, when CO2 concentrations go up. My point is that there is room for those sorts of mechanisms in the basic physics and measurements constraining what is reasonably possible. Eg as I pointed out earlier, the Earth system could via biological, physical, chemical processes affect albedo sufficiently to precisely counteract the radiative effect of CO2. What’s missing is the concrete workings of how this would happen, certainly in the example of cloud albedo precisely negating the effect of doubled CO2. Though if quadrupled CO2 causes 2C directly, another 2C via water vapour feedback and a final 2C via clouds, I am quite partial towards the possibility of helping nature’s complex systems along a little by getting the clouds to subtract 2C rather than adding them, if they won’t kindly oblige to do it on their own without anthropogenic prodding … I am a technophile in the end, rather than an “environmentalist”. Indeed, such possibilities cannot be rejected beyong any doubt. The more important question however is, how likely are they (or other ‘mysterious’ effects for which there is no indication of them occurring)? Where does the available evidence point to? How robust is it? Is the available evidence coherent? What’s the wiggle room for the uncertainty when you take all the evidence into account? Just saying clouds are uncertain, and therefore the sensitivity may as well be 2 (or 4 …) rather than 3 degrees per doubling omits the relative probablility of the different values in light of the combined evidence. It infers a strong solar control on European temperatures over a 350 year period. It also acknowledges the contribution of GCR, noting that the effective lag times between solar and GCR in the correlation are a little different. I believe that Mike deserves some credit for this paper since it does apparently reverse some of his earlier views on solar contribution. Time to dust down the series of post 2005 papers by Nir Shaviv, I think??? Ergo, yes it is possible to get a good correlation – and much better in fact than the CO2 correlation. The big problem with the solar theory, as Lockwood explains, is the required x13 amplification factor. However the CO2 theory also needs an amplification of x3 plus several handwaves involving aerosols, natural variation “noise”, to explain those peaks and troughs that cause the very poor correlation with CO2 rise. Bearing in mind the lack of stratospheric cooling (apparently the one true signature of AGW according to realclimate.org and the IPCC) since 1995 and the pause in tropospheric and surface warming since that “unnatural” 1985-1998 rise, some now like to claim the “plateau” is due to a waning sun. After all, if CO2 is supposed to be dominant since 1985 then why is there any pause at all? As Trenberth notes in the climategate emails, we certainly don’t actually know where the extra heat required by the AGW hypothesis is being stored. Sure we can guess, but the solar hypothesis, of course, has no such problem. In short, if you try to look objectively, the dominating-CO2 hypothesis has just as many, if not more, problems that require explanation than the dominating-sun hypothesis. But beware of applying realclimate-style handwaves and guesses to fill in these gaps for AGW because they work just as well for natural warming: For example “according to the sunspot data we should have plateaued in 1960 but this was interrupted by aerosol cooling followed by rapid warming after the clean air act.” Such arm-waving is easy to do but is not scientific; it is mere opportunism. I hope you would refrain from using simplistic analogies and acknowledge this is indeed an area open to discussion and research with the current state of data and help us better understand the climate system. The climate system’s behaviour is indeed mysterious – as Phil Jones and Kevin Trenberth readily attest. Trenberth’s article contains a more honest version of the very graph you have in place in your post. With a more appropriate dimensions for the timescales and anomaly values and an anomaly scale that starts with a non-zero value. JamesG: Excellent comments, but I don’t believe that one needs to look for a x13 amplification factor for solar. This applies only if one considers instantaneous balance of power, rather than cumulative energy difference – the integral form. The important issue then is whether the cumulative solar input (allowing for albedo reduction effects) leaves the system above or below the temperature-forcing equilibrium. You might note in the comments section of the above reference Nir’s June 30th response to the question of trends in TSI and CR in the last 50 years. What was the forcing that caused the warming from 1910-1945? What happened in 1945 the (abrupt) cooling? Global temps are influence by a variety of factors, some of which can be enhanced by human activity (eg greenhouse gases). I.e. the first part of the 20th century, increases in solar acitivity and GHG and a decrease in volcanic activity were important factors in driving the warming. Increased aerosol loading caused the plateau in temps in the middle of the 20th century, and GHG are the dominant forcing for the warming since the seventies. 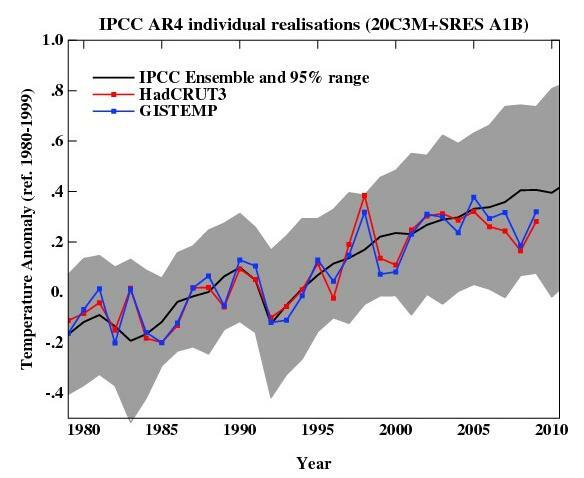 According to the IPCC AR4 the global (!) warming from about 1910 to 1940 (being 30 years) was 0,5C. After that it cooled 0,2C (just like from 1900-1910 which I can neither explain). Than it stayed about flat untill about 1976 when the real warming began (by the way this last warming correspondends with the phase shift of the PDO). This book also shows that the current Ice-conditions in the Arctic are not unusual and dependent of many factors and not only temperature. 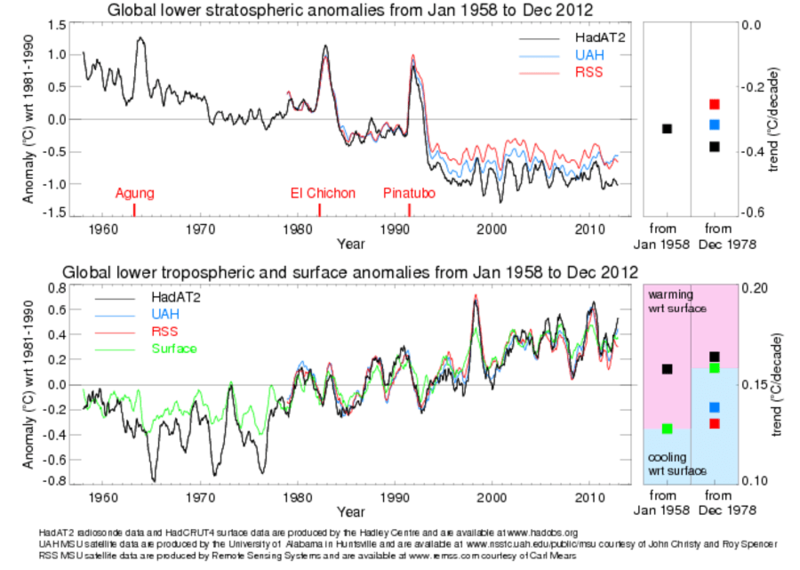 twentieth-century warming is mainly caused by natural forcing in the model (mainly solar). VS was right: adjusting the variables to match the observed temperature change. It’s worse than I thought. What we see is how science often works – increases in knowledge by increments and independent studies re-affirming previous findings, namely that changes in the sun play a minor role in climate change on decadal to centennial scales. After all, 2009 was the second-warmest year on record, and by far the warmest in the southern hemisphere, despite the record solar minimum. The solar signal for the past 25 years is not just small but negative (i.e. cooling), but this has not noticeably slowed down global warming. But there are also many unknowns remaining, and the largest uncertainties concern clouds, cloud physics, and their impact on climate. In this sense, I find it ironic that some people still rely on the cosmic rays argument as their strongest argument against AGW – it does involve poorly known clouds physics! There’s many different kinds of studies being done looking at attribution. GCM’s are physics based, and is not a matter of curve fitting. If I recall correctly, the Meehl study investigated the physical response to individual forcings. Nothing nefarious about that; it actually offers usefull insights. Other studies have indeed done analysis that could be described as curve fitting (e.g. Lean and Rind). Different, but also useful. In a way comparable to a mathematical cointegration analysis, in the sense that it just attempts to get the best fit, rather than starting from a physics based model. But even then, you can chose to use physics based estimates of what’s happening (ie using all lagged forcings) or not (i.e. 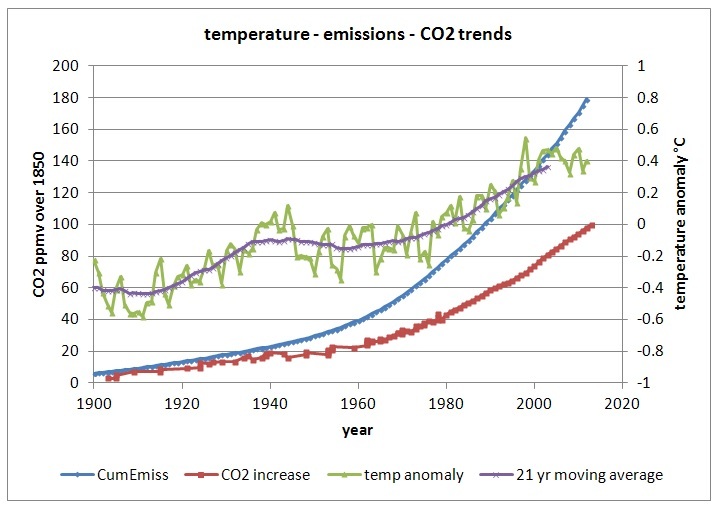 using a linear trend or only CO2). Even though a great deal is known about glacial-interglacial variations in climate and greenhouse gases, a comprehensive mechanistic explanation of these variations remains to be articulated. Similarly, the mechanisms of abrupt climate change (for example, in ocean circulation and drought frequency) are not well enough understood, nor are the key climate thresholds that, when crossed, could trigger an acceleration in sea level rise or regional climate change. Furthermore, the ability of climate models to simulate realistic abrupt change in ocean circulation, drought frequency, flood frequency, ENSO behaviour and monsoon strength is uncertain. Neither the rates nor the processes by which ice sheets grew and disintegrated in the past are known well enough. Knowledge of climate variability over the last 1 to 2 kyr in the SH and tropics is severely limited by the lack of palaeoclimatic records. In the NH, the situation is better, but there are important limitations due to a lack of tropical records and ocean records. Differing amplitudes and variability observed in available millennial-length NH temperature reconstructions, and the extent to which these differences relate to choice of proxy data and statistical calibration methods, need to be reconciled. Similarly, the understanding of how climatic extremes (i.e., in temperature and hydro-climatic variables) varied in the past is incomplete. Lastly, this assessment would be improved with extensive networks of proxy data that run right up to the present day. This would help measure how the proxies responded to the rapid global warming observed in the last 20 years, and it would also improve the ability to investigate the extent to which other, non-temperature, environmental changes may have biased the climate response of proxies in recent decades. We know whom this paraphrases. It is Briffa. The non-temperature environmental change that has biased the climate response of the proxies is….CO2. A lack of understanding does not mean an effect does not exists. I’ve followed the debate on solar for years, and there are some major flaws that I see, that must be addressed. For starters, the solar activity has been constantly high in comparison to minimum conditions. TSI, as well as SN were well above normal from 1940-2001. The argument that the sun has no effect is based in the assumption that there is no thresholds. Thus, just because you see a decrease between 1980 and 2000, doesn’t mean you will see an immediate decrease in global temp, primarily because of the internal dynamics of the climate system that are always omitted. Roy Spencer has a new book out on it, explaining that the flaw of the models is that they rely totally on external forcing, as opposed to including the effects of internal elements. All indications are that Solarcycle 24 is going to be pretty weak, as in the magnitude of solar activity seen prior to 1940, and maybe even constistent with minimum conditions. I don’t expect an instant drop in temps, simply because out planet is made of water, and water doesn’t instantly cool. But, before anyone dismisses anything about solar influence on climate, I think it’d be best to see what the influence of solarcycle 24 will be. As I told another blogger, enough of this speculation, especially based on models. Let’s see what happens with this current cycle. Collect the data, do more analysis, and then we will have a better case to make for or against a solar mechanism. Seems to me that it would be reasonable to see all these things at some sort of reasonable scale to each other. You did notice that this post just mentions measurements, right? And that solar output has not changed appreciably in the past 50 years, right? So it couldn’t have caused the upswing in global average temperatures. No model needed so far. Besides, what’s this negativity towards models? They’re just a simplified mathematical representation of what is known physically. A useful tool. Not more, but not less either. There again Bart, you do not have any proof otherwise. When you turn on the burner under a pot of water, it doesn’t instantly boil. When you turn off the burner, it doesn’t instantly cool. 6 of the last 7 solar Cycles have been over 150 SN, whereas the 3 solar cycles of the dalton minumum were below 100, and the Maunder was below 50. So .. we go from 180 SN [cycle 21], to 200 SN [cycle 22], to 155 SN [cycle 23] … and people who are opposed to any kind of solar input claim this is a change. Yet, like I said, the peak of the Dalton was under 100, and the Maunder was below 50 SN. Let cycles 24 and 25 come in under 100, and let’s see what happens to temp. So … like you said, I don’t need a model to see the effect of the sun on Climate. There is as much evidence that it exists as there is CO2 driven temps. Further, we KNOW that CO2 is not capable of creating the warming, a doubling would give a rise of about 1C. The AGW theory explicitly relies on assumed feedbacks, that are very poorly understood. And even here, your correlation could very well be spurious .. as it is known science that as water warms, its capacity to hold CO2 decreases. Which came first, the chicken or the egg .. .the CO2 or the Warming. Vostok argues that temp leads CO2. Studies at th Hawaii site confirm this on a shorter scale. AND .. none of this even takes into account the possible links between A Index and climate, which fluctuates drastically compared to the TSI or SN. Your position will be disproven or confirmed based on the next 10 years. But at this point, I’m not jumping on board. When you turn off the burner, the water doesn’t start heating up miraculously a few minutes later. The excess CO2 currently in the air comes predominantly from fossil fuel burning; not as a feedback on temperature. That is about as certain as things get in science. A more relevant example would be, whent you turn the burner down from high, to medium high, when the water has not yet boiled, … the water most certainly does keep heating up. As long as the heat comming in is greater than the temperature of equilibrium, the water will continue to heat. As long as the sun is perking along above 150SN, one cannot say that there’s been a decrease in solar input. Look at cycle 20 … the SN dropped to about 120, and the temp most certainly did cool. The magnitude of change between cycle 19 and cycle 20 was from 250 SN to 120 SN .. a 50% decrease in SN. If cycle 24 comes in around a max of 75 SN, which would represent a real decrease in solar input, as opposed to a change from 200 to 150, I think you are going to see the effect that is represented in the record throughout history. Another flaw that concerns me regarding the skeptics of solar influence on climate is that they do not take into account the magnitude of change. They are hung up on unit/unit change … that x change in solar unit should equal y change in temperature, .. when the evidence says a magniture of change >X in solar = change in temperature. Until the magniture of change crosses the threashold, you will not see any significant change, thus allowing lesser forcings, such as CO2 to have an effect. Like I’ve said Bart, I’m not trying to say it “IS” what is going to happen, just that if we are going to look at solar as a possible mechanism, we have to use the relevant numbers …. those numbers being the difference between minimum conditions and maximum conditions on the longer term scale. [ie., sun spot numbers of less than 100 vs sun spot numbers greater than 150. Good Lord Man. There is no such thing as “excess” CO2. Plants like CO2. More CO2 means more plants. More plants mean less CO2. Higher CO2 equals more food – Rising concentrations of atmospheric CO2 stimulate plant grown, resulting in higher agricultural yields. As Dr Craig Idso and Dr. Keith Idso have shown, a 300 ppm increase in atmospheric CO2 will increase the yield of nearly all food crops by 30 to 50 percent. According to both researchers, the expected rise in CO2 concentrations by 2050 will increase world agricultural production, but to levels that barely will be enough to prevent widespread famine. Efforts to limit CO2 would retard both industrial and agricultural production. The U.S. Department of Agriculture (USDA) has determined that a one percent increase in CO2 boosts crop yields by eight percent, translating into a 33-pound-per-acre yield per 1-ppm rise in CO2. The USDA also found that a field of corn in full sunlight consumes all of the CO2 within three feet of the ground. The corn will stop growing unless the surrounding air is stirred constantly by wind currents. In fact, the plants are harmed at CO2 concentrations of 240 ppm, and they die at 160 ppm. Just for fun, you could graph U.S. crop yields next to CO2. Pre-industrial CO2 concentration was 280 ppm. It is now 390 ppm. The difference is what I refer to as the excess (above pre-industrial values). It is higher than it was, period. And we know why it’s higher. For climate, it’s the energy balance that counts. If there are changes to this balance, the climate will change. E.g. more solar radiation -> climate will warm up. Less solar radiation -> climate will cool down. With a time lag. But once the solar radiation stops going up, the climate will *not* suddenly go up decades later. If you have a physically plausible explanation how it could, contact Nature or Science. I’m sure they’d be interested. “Pre-industrial CO2 concentration was 280 ppm. It is now 390 ppm. The difference is what I refer to as the excess (above pre-industrial values). It is higher than it was, period. And we know why it’s higher. Anthropogenic contributions. And, It doesn’t matter if we know why it’s higher or not. Fact is that plants are going to use it to do more of what plants do, and, on a planet who’s human population numbers in the billions, and is growing that’s probably not a bad thing at all. In fact, if you look at the USDA data, you could contend that we were/are close to a CO2 starved environment, as far as an awful lot of our food crops are concerned. But once the solar radiation stops going up, the climate will *not* suddenly go up decades later. If you have a physically plausible explanation how it could, contact Nature or Science. I’m sure they’d be interested. Isn’t there supposed to be this whole thingy where the ocean stores heat? Heat storage causes the response to lag behind any changes in the energy balance. I.e. the temp starts responding when the forcing changes, and after the energy balance is restored (or in this case, the sun became ‘constant’ again), the temp will continue to change for a while (though at a slower pace), and then slowly equilibrate to a stable value. It will *not* ramp up sharply long after the forcing has stabilized; you cannot possibly explain that by inertia. Analogy: The sun shines brightest at 12 noon, however the max temp is reached later in the day (say, 4 pm). The rate of temp increase however has slowed down between 12 and 4 (actually, if the maxs is at 4, the rate of increase is zero at that point). What we usually do *not* observe is that the temp is constant from 12 to 8 pm and then suddenly increases sharply. And if it does, I’d wager that it’s not due to the solar output. Yes, Bart, but, what are we seeing? We’re seeing temperatures basically flat since the last sunspot maximum, and, right now, we’re seeing a little bump caused by an El Nino heat belch, which, frankly, nobody seems to know what causes it. It fits pretty much perfectly if you consider the Ocean as the governor of Climate. Is 10 years too long for the Global Oceans to be giving off a significant amount of stored heat? What is going to be really interesting is, as this El Nino fades, and the negative PDO takes over, and the sun is slowing down, is what happens. If CO2 is monotonically increasing, and solar activity isn’t playing any role, then, shouldn’t this El Nino anomaly have been significantly warmer than the one in 1998? Actually Performer, as admitted by Phil Jones, there’s been no significant warming since 1995. There was a large jump between 1975 and 1995, now it has prettymuch leveled off. There is a lot of reserach comming out regarding the PDO, AO, solar, and internal workings of the climate system. Futher, a new study conducted by a scientists in Mexico disputes the physics of the AGW theory, wherein he makes the case that climate is contolled by the oceans, and subsurface heat sinks based on the laws of thermodynamics. It refutes the assumption that GHGs re-emit radiation back to the ground. There are so many issues floating around right now. Key to all of them is the question regarding the quality and validity of the data itself. Between station locations, station drop out, and the “adjustments” made to the data, it’s questionable that there’s been any significant warming at all. The issue I’m waiting to see solved is the involvement of the sun. I’m not a proponent, but I’m also not a skeptic. .. I’m simply waiting to see. As I’ve noted to Bart, there’s been no real decrease in solar energy between 1980 and 2001. Cycle’s 24 and 25 are looking to be and predicted to be very low, as in Dalton or even Maunder minimum levels. We live in exciting times at getting to the truth regarding the solar influence on climate, .. the only thing we need to do is hold back the reigns on the supporters of AGW, and make them dissociate themselves from the politcs of the issue, .. and WAIT to see what data comes forth. The 1940-1975 cooling being caused by aerosols has always been a dodgy part of AGW; for a start the NH should have cooled more than the SH because there were more aerosols in the NH but the SH was cooler during this period; secondly aerosol production continued apace well into the ’80’s after the climate shift in 1975-76 which featured an abrupt increase in temperature; thirdly aerosols do not have a straightforward cooling relationship with temperature; their effect on high cirrus cloud and consequent effect on temp increases is well documented, particularly in the mid to high latitudes [ie the Arctic]. The aerosol theory is a bit like the ‘bucket’ temp controversy: leaky. However, there have been several downward movements in temp during that general upward trend; notably the increase in temp from 1910-1940 was as steep if not more pronounced than the post 1976 increase; AGW effects should have kicked in from about 1960 onward when CO2 levels ramped up but temp was down until 1976 and has been flat since either 1998 or 1995 if you believe Phil Jones and Lubos. So really the AGW effect is limited to a warming period from about 1976 – 1995/8. What was the sun doing during this period? Pinker’s paper shows an increase in BOA received SW from 1983 – 2001 of 0.16m2 pa; this period was broken up into a slight decrease of BOA SW from 1983 – 1992 and an increase from 1993 to 2001. The increase in SW 1992-1995/8 is sufficient to explain heating despite a ‘flat’ sun because of reduced cloud cover, but SW was decreasing from 1983. So AGW gets a look in from 1976-1992. Don’t confuse uncertainty with knowing nothing. Google ‘historic SO2 emissions’ (an important precursor to anthropogenic aerosol) and the first document to come up is this one. Look at Fig 1 (page 10). There are good reasons to believe that anthropogenic aerosols increased sharply in the middle of the 20th century. The hemispheric temp difference is influenced by multiple factors, differential aerosol loadings being one of them. Another biggie is the much larger amount of land on the NH, which counteracts the effect of the differential aerosol loading: The NH (having more land) warms up faster than the SH. I’m not sure how well the hemispheric temp difference is understood quantitatively in light of these and other considerations, but it seems that you’re jumping to conclusions just a little bit too fast. As to you other question, “what was the sun doing?”, I provided some graphs in this post exactly to address that (for different time periods). As can be seen CO2 has consistently increased almost montonically in the 20thC; however the AGW position is that the temp increase to 1940 was due to natural factors, the 1940-76 dimming had AGW suppressed by aerosol cooling, post 1976 warming was due to AGW manifesting when dimming ceased [even though aerosol levels at best leveled off], and presumably the temp flattening post 1995/98 is due natural factors suppressing AGW as per Keenlyside and Easterling. That’s a lot of leg-ups for AGW; I don’t think it’s uncertainty, more like creative accounting. The fig of volcanic aerosols actually shows that volcanic activity was rather low during the mid 20th century. If aerosol levels *level off*, they no are no longer expected to cause a *change* in temperature. Exactly; my point was that during the warming periods at the beginning and end of the 20thC there was large aerosol output from volcanos; that didn’t have a cooling effect but the anthropogenic aerosol production during the middle of the 20thC allegedly did. That is interesting; isn’t it what Beenstock said about CO2 and temp that the first difference of CO2, or change in CO2, is related to temperature and not absolute level of CO2? Large volcanic eruptions did have a temporary cooling effect. If the forcing doesn’t change, the temp will only change as much as is needed to re-establish equilibrium, and then stay ‘constant’ (with some weather related variability superimposed of course). But the the temp will not go back to what it was before. This is a crucial point; in my opinion it is defeated by the decrease in temp from 1940-1976 and from 1995/8; but rather go down the aerosol path again the PETM is of interest; the PETM is often put forward as an example of CO2/ghg forcing but temp increase preceded the increase in CO2; the temp recovery to pre-PETM levels, given the 70% increase in CO2 and sudden spike in temp of over 6C, was very quick [between 30-80k]; but the temp recovery happened while CO2 levels stayed high. Then when CO2 levels started to decline temp increased to PETM levels at the peak of the Eocene Optimum while CO2 levels continued to decline. In short the PETM seems to contradict the AGW point of equilibrium climate sensitivity based on a new level of forcing through CO2 increase.. Fig 3 from the 2nd link sums up my difficulty with AGW; it predicts, at the higher range, an Eocene temp equivalent by 2100 when CO2 levels may be 2xCO2 referable to 1900, or about 560ppm; the PETM featured CO2 levels of 1700 ppm with no Greenland or Antarctic permanent ice shelves and a base temp much higher than today; this does not make sense. Warming preceding the CO2 release isn’t good news at all, since it means that nature may have some bad surprises (strong positive carbon cycle feedback) in stock when warming exceeds a certain level. Ha, nature always has some bad surprises; only the other day I got out a picture of me taken when I was 20 then looked in the mirror. How long was the influence on temperature of Pinatubo in 1991? What would have happened with the temperatures from 1991 untill now if Pinatubo wouldn’t have errupted? The temporary (couple of years) dip in temps wouldn’t have occurred if Pinatubo hadn’t erupted. So without Pinatubo the temperatures in 1991, 1992, 1993 and 1994 would have been the same or higher then 1990 and 1995 (from end 1991 to mid 1995 there was a long El Niño). I wonder what Phil Jones would think of that now. Bart, the influence of the Sun is not limited to direct solar irradiance. Furthermore: cosmic rays do not originate from the Sun. The low solar activity in recent years may have contributed to the cold winters of 2009 and 2010. I’ve heard of and investigated the GCR-climate theory, and find it wanting. What cold winters in 2009 and 2010? Yes, *locally* cold winters. But most assuredly not globally. In fact, December/January/February 2010 was one of the warmest periods, globally, ever! Bart: the article you refer to is a review article in whch you fail to discuss the research of Svensmark’s group. Strange, because Svensmark’s theory offers a plausible explanation for the Global Cooling during the Little Ice Age. In the blogpost you mention that “low solar activity played a role in the Little Ice Age”, but you fail to mention a mechanism that explains the effect of low solar activity. In the blogpost above you also omit the effect of urbanization, which can partially explain why nighttemperatures increase more tha daytemperatures. And you have missed the global brightening which occured since the mid-seventies by reduction of air-pollution and aerosols. The RC post was quite long as it is. Can’t discuss everything in one post. We’ll see in the coming years whether the low solar activity has an effect on the Earth’s climate. Cycle 24 seems to be stuck in square one: sunspot number is still low. @Bam: the high temperatures of dec 2009 – april 2010 are caused by El Nino. Of course solar activity has an effect on climate. I’ve never heard or read anyone claim otherwise. From solar min to solar max the influence on temp has been estimated at around 0.1 deg C (some scientists came to 0.2), and the LIA was at least partly influenced by a sustained period of low solar activity, combined with high volcanic activity (see eg the wikipedia link I provided in the blog post). If the sun enters such a sustained period of low solar activity again, it could dampen the global avg temp by between 0.1 and 0.4 deg (eg recent paper by Rahmstorf; KNMI climate science update). When the sun picks up strength again afterwards, the damped warming would of course return, so don’t let it give you a false sense of security. Should I take that as an implicit admission that you were wrong to point to the winter of 2010 and linking it to low numbers of sunspots? Note that the El Nino still doesn’t explain why it is *this* warm. It’s (at best) a moderate El Nino, not like the extreme El Nino we had in 1998. Add the relatively quiet sun (unlike in 1998), and we’re in a bit of a pickle to explain why the last 12 months have easily been the warmest 12 months on record. Bart, why do I need a sense of security? The sun, the volcanoes, El Nino will behave as they always do, unpredictable. We will have to adept to the climate we get. Humanity is not in charge, we are not at the helm. El Nino is a giant transfer of heat from the ocean to the atmosphere. It takes years for the heat to build up in the ocean and just half a year to release it in an El Nino. So what warms the ocean in the years between two El Ninos: direct sunlight, nothing else. Most of the sunlight that hits the oceans, is absorbed in the watercolumn. That generates the heat that is released by El Nino. El Nino is not a symptom for greenhouse warming. @cassandraclub: no need to tell me what an El Nino is. But I see you are mixing up local effects with global effects. I’m trying to get you to explain how a moderate El Nino combined with a weak sun (which you claim will cause cold winters (but where?)) gives the warmest 12 months on record. Note that in 5 of those 12 months there was no El Nino to blame (which usually acts somewhat delayed anyway). Bam, I am only pointing out that the high temperatures of the last months are a just temporary warming, not a sign of permanent climate change. Excuse me for mixing up local and global effects. I have been hearing for years that local heatwaves, droughts, floods and even local melting of sea-ice are proof of permanent global climate change. I have to disagree with your claim that “[you are] only pointing out that the high temperatures of the last months are a just temporary warming, not a sign of permanent climate change”. After all, at the same time you point to the current weak sun as some type of long-term cooling agent. Oh, and increasing numbers of droughts, heatwaves, floods, and the long-term trend of melting sea ice are exactly that: a trend towards a warmer climate. And one that physics directly relates to the enhanced greenhouse effect. P.S. : could you explain how the recent winter was the coldest of the milennium? Either it is semantics, or you are being duped by someone else. Yes, I looked at your blog, and my Dutch is good enough to get the general idea. the high temperatures of the last months are a just temporary warming, not a sign of permanent climate change. Well, duh. Of course the temps of only a few months are a sigh of something temporary, climate wise. That’s why is makes sense to look at longer term change when you want to say something about climate change. Bam: since the new millennium started just 10 years ago, the winter of 2010 was the coldest of this milennium. I hope global warming didn’t affect your wit and sens of humor to much. Bart: if we look at the longterm changes we have tot conclude that man has no influence at all. Ice-ages came and went before humans even evolved. My point being: the concern for CO2-emissions is just a way to prepare us for the shortage in oil, gas and coal. We have to change our way of life, because we will run out of cheap energy. We have to solve this problem somehow. Your answer to Bart is a matter that has been discussed many times already. It’s like saying “forest fires already occurred before man came around, so no forest fires are caused by man”. In addition, Toby Tyrrell and David Archer have both warned that BAU scenarios for another 100 year or so is likely to abolish the next few ice ages. Forest fires occurred long before humans even evolved. Does that mean I cannot possibly start a forest fire? @Bam: CO2-emissions are already decreasing. There is simply not enough cheap fossil fuel to continue BAU for more than 5 years. May I remind you that already 3% of all fuel burned daily is biofuel. Without biofuel, CO2-emissions would be down even more. It would be great if we could prevent an ice-age and the mass-extinction that an ice-age would cause. Don’t get your hopes up though, because the Milankovitch-cycles are unforgiving. Please explain Bart: Do you think we humans can start an ice-age or end one? How did previous ice-ages start ? And how can we start an ice-age ? Please post under only one name; makes it easier to track who’s who. Re Ice ages, you could start by checking http://www.aip.org/history/climate/cycles.html or other good sources. I wrote something about it here, which probably is a very useful post for you. 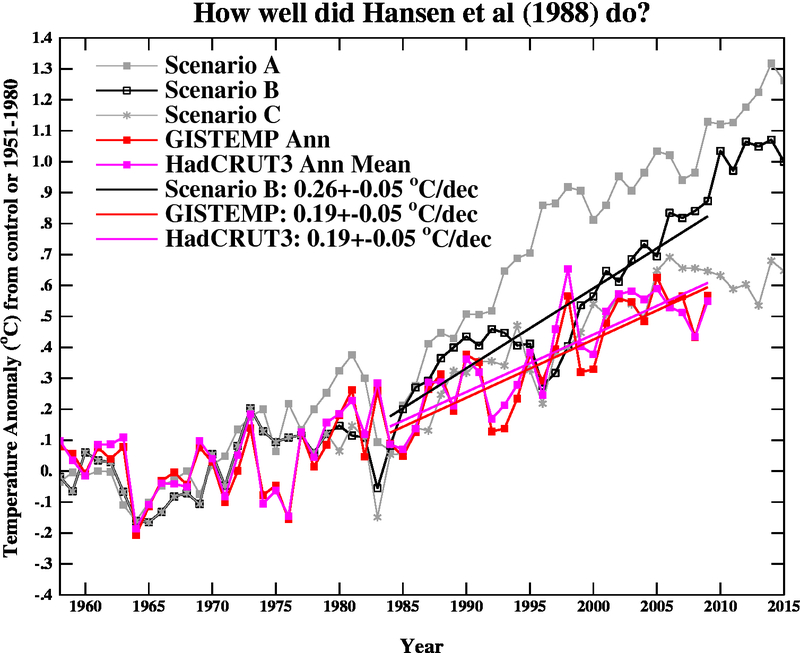 And note that AGW is expected to increase temperatures on a time scale that may well have never occurred before. Note also that the warming events have usually been relatively rapid events, while the ice ages are slower. Evolutionists will be able to explain to you why the former are more likely to affect many species than the latter. In fact, I think you can imagine that yourself with the more simplified high school evolutionary biology. It’s also ‘easy’ to start an ice-age: just throw a huge amount of aerosols into the air, and keep that up for many years. It’s even one of the proposed mitigation strategies. We’ll just have to hope we don’t put too much into the atmosphere. Bam: Mauna Loa cannot distinguish between manmade CO2 and “natural CO2”. In my opinion Europe and the US are using less fossil fuel than 2 years ago: check Oilwatch Monthly by Rembrandt Koppelaar. I disagree with you on the fossil fuel use for the coming decades. There is a big dfference between estimated reserves and proven reserves. And it probably will be impossible to extract another 1000 GtC fossil fuel from very hard to reach reserves. Drilling in deepwater and extracting oil from tarsands will be to costly for any society. Peakoil, peak-soil, peak-phosphorus, peak-biofuel, shortage of freshwater and shortage of credit and capital. Mauna Loa would give a lower trend if there are lower anthropogenic CO2 emissions. And I sincerely hope you are not one of those that believe the observed increase in atmospheric concentrations is at least in part “natural”. I’m afraid you are also forgetting that oil is just one of the three main fossil fuels being used. Oil use may be down in the US and Europe, but it’s up in China and India, and the latter two (especially China) is also using more and more coal. Proven and extractable (economically!) coal reserves are enough for another 150 years or so of current-day use (which easily amounts to 300 Gt, if not much more, I didn’t do the actual calculation). Natural gas isn’t known to be near-peak either. There’s no proof for that assumption. I agree with you that there is a lot of coal left. But there is no indication that cars and planes will use coal in the future. The key-concept is the economical-extractablility of coal,oil and gas. In my view our society is already at the limits of resource extraction. Deepwater drilling, biofuel and extraction from tarsands yield very low energyreturns. If it takes an investment of 1 barrel to produce 3 barrels of oil, (EROEI=3) we cannot afford to keep doing so for very long. Muscle-power will be cheaper and more efficient in the long run. For now you can see a drop in the oil-consumption of the OECD, which means a drop in the CO2-emmission. I don’t have the figures, but I guess coal-consumption is also down, because of more wind and solarpower. If we stop using biofuels we can even cut more CO2-emissions!!!! No proof for that assumption? We know that more than half of the anthropogenic CO2 is taken up. Biosphere and oceans are thus (still) active sinks. Less anthropogenic CO2 is therefore likely less increase in CO2. I’d say there is no proof for the contrary assumption. Doesn’t look like the IEA believes there is a limit to the extraction of coal in the near future. Bam: you are welcome at my blog (cassandraclub.wordpress.com) to discuss the end of the fossil fuel era in detail and in Dutch. In my opinion the fossil fuel era will come to an end before 2050 and the predictions of IEA, EIA and the IPCC are unrealistic. Hans, my Dutch is not good enough to have a discussion in Dutch. I can read it quite well, but writing is a different story. And I don’t see why your predictions would be any more reliable than those of the IEA. What is quite obvious is that just the amount of currently-known reserves of economically-viable extractable coal is enough to keep CO2 concentrations in the atmosphere rising for another 100 years. Coal alone. That will only stop if someone orders people to stop using coal. I don’t see anyone doing that as yet. Bam: the predictios are not mine, but from experts in the oil and gas industry. I get my data from theoildrum.com, peakoil.nl and other independent sources. IEA and EIA are linked to the oil-industry and they don’t want shares of oilcompanies to collapse. IEA and EIA make estimates and predictions that are completely ridiculous. Let me re-assure you: before 2050 the fossil fuel era will end. CO2-emissions will drop, the IPCC-scenarios will not unfold. I plan on leaving in 20 years from now. Hans, oildrum.com does not have any experts in the oil and gas industry on its ‘staff’ (self-styled experts, perhaps). Neither does peakoil.nl. And both focus mainly on oil. That’s one-third of the fossil fuel use. The IEA also has links to nuclear power companies, wind energy companies, biofuel companies, etc. Hans, you are quite wrong when you say “In my opinion the fossil fuel era will come to an end before 2050 and the predictions of IEA, EIA and the IPCC are unrealistic.” BP may not be much good at controlling oil spills, but for 50 years their data on oil production, consumption and proved reserves have proven to be spot on. As of last year, proved oil reserves were equal to 42 years of current consumption (nearly 4 GtC p.a or 81.44 barrels per day), and they have never been less than 30 years in my experience. Now it is likely that consumption will rise, but so will proved reserves for some time yet, perhaps for ever if Thomas Gold is right (see his The Myth of Fossil Fuels). Cheer up, the end of the fossil fuel era is far from nigh. And I can afford to be completely wrong, if there really is plenty of oil. But can you afford to be wrong ? Dear Bart, where can I find information on the current CO2e level and emissions, and how does this relate to the 350 and 450 limits; i.e. are these CO2 or CO2e? To calculate the radiative forcing for a 1998 gas mixture, IPCC 2001 gives the radiative forcing (relative to 1750) of various gases as: CO2=1.46 (corresponding to a concentration of 365 ppmv), CH4=0.48, N2O=0.15 and other minor gases =0.01 W/m2. The sum of these is 2.10 W/m2. Inserting this to the above formula, we obtain CO2e = 412 ppmv. Aerosols however exert a negative forcing, which, on a global average at least, masks a good bit of the positive GHG forcing. On the targets, 350.org explains that the initial target was meant for CO2 only, but that now their 350 aim is for CO2 equivalents. I.e. 350 is for CO2 only, but it should be understood that this cannot be combined with unlimited growth of the other GHG’s and BC. Due to their much shorter lifetime, their atmospheric concentration can be reduced much faster though. That means that, unlike for CO2, a temporary spike could be relatively fast brought back to ‘safe’ levels (whatever they are deemed to be). Most by far of the Earth’s airborne CO2 comes from the sea. It is held in 18x more concentration than air at sea level. You can simply see the yearly cyclic changes of CO2. It’s not you people switching on the c/h in the summer! Between 100% CO2 and zero, the 50% absorption position is agreed at 60ppm. Yes, you read that right. Go find out yourselves. We have had almost a lifetimes excess Solar activity. The heat gain is accumulative. Warmed sea’s give off CO2 like a slightly warmed soda pop. The greatest mass by far of methane also comes off the sea surface. CO2 is the symptom, not the illness. There is not, never has been and never will be anything bad coming from this CO2 rise. It is trapped air from long ago and is now back into the carbon cycle, making this planet more verdant. Apart from all that. There has been no warming in this past decade.